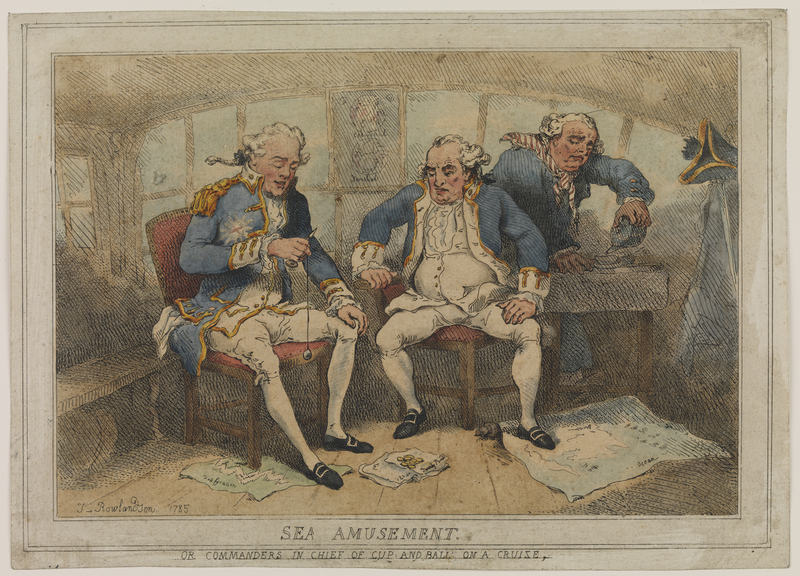 "Commanders Engaged at Sea," Thomas Rowlandson, 1785, Royal Collection Trust. "Sea Amusement or Commanders in Chief of Cup and Ball on a Cruise," Thomas Rowlandson, 1785, National Maritime Museum. The addition of the colorized piece to this year and a half old post, allowing a nice revision, comes to my attention from the ever attentive Adam Hodges-LeClaire. 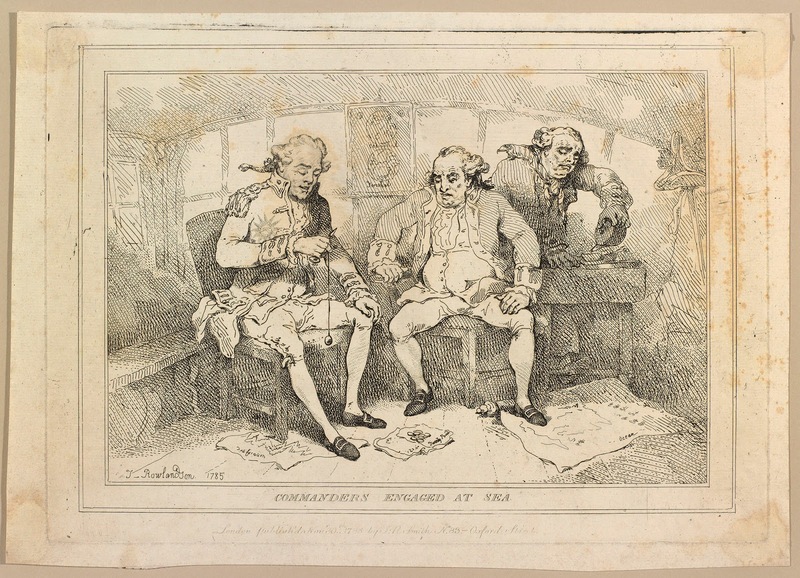 In a pretty typical piece by Rowlandson, a pair of officers waste time in what appears to be the gunroom or the captain's cabin. 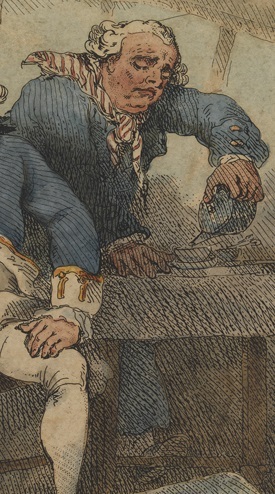 The print in the Royal Collection Trust is the same as that of the National Maritime Museum, save for the fact that the NMM's print is colorized and they have different titles. Generally speaking, the study of officer's uniforms is not the purpose of this project. I will not focus on the gentlemen in the center of the frame, but the surly looking steward just behind them. The disinterested tar pours their tea with downcast eyes. His short jacket has a mariner's cuffs which are fastened with two brass buttons. In his role as a steward, he likely was required to show some semblance of an orderly uniform. This may explain why the cuffs are buttoned when so many images show them wide open. His neckcloth is white striped with red. 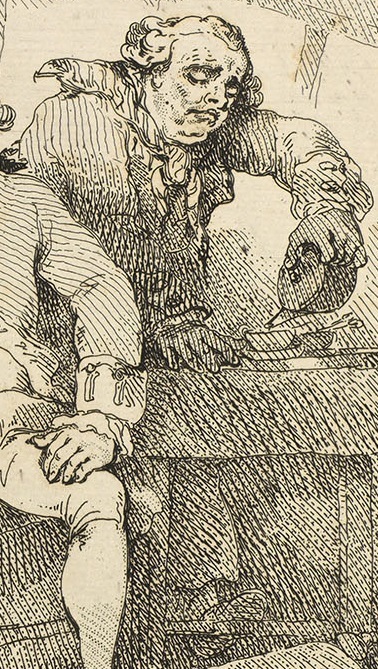 From beneath the table we can see that he wears round toed shoes and a pair of blue trousers with loose legs that end just above his ankle. His stockings are white.